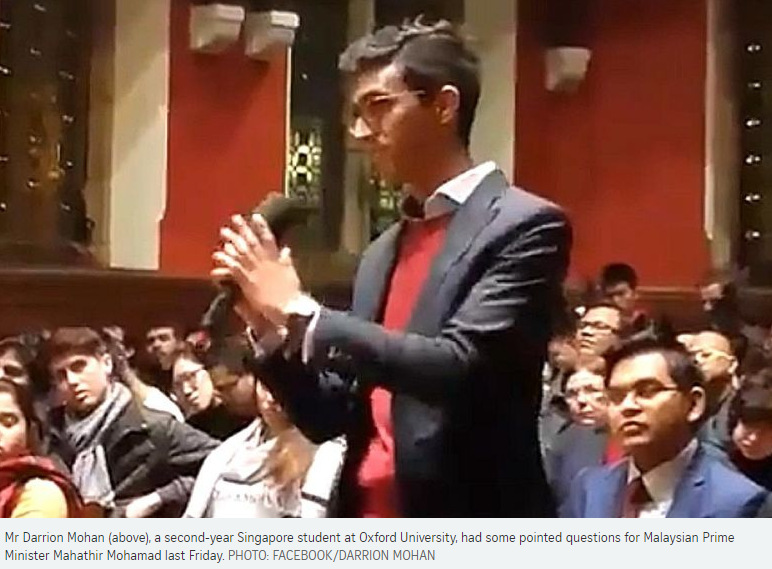 A Singapore student at Oxford University took on Malaysian Prime Minister Mahathir Mohamad last Friday, asking the elder statesman candid questions on the prickly diplomatic relations between the two countries. Mr Darrion Mohan, a second-year history and politics undergraduate, began by saying that Singapore and Malaysia were "again embroiled in an unnecessary and potentially internecine maritime dispute", referring to the Johor chief minister's recent intrusion into waters off Tuas. He then asked Tun Mahathir, who had earlier given his address at Britain's prestigious debating society, the Oxford Union, if any action would be taken against the chief minister. "Would you not agree actions like this contribute to the perception that your government is pugnacious, that your government acts in bad faith and that your government... wants a return to the days of confrontational diplomacy and barbed rhetoric?" he asked. Dr Mahathir did not immediately answer Mr Mohan's questions, and instead asked if he was a Malaysian. Mr Mohan then sought to bring the discussion back to the issues he raised, listing the Singapore-Kuala Lumpur high-speed rail project, the airspace dispute over Seletar Airport, the proposed "crooked" bridge between Johor Baru and Singapore, calls to revise water supply prices and the maritime dispute as indicators that Dr Mahathir wanted a return to the "fraught relations with Singapore" seen during his first stint as premier between 1981 and 2003. Dr Mahathir responded by saying that the 1962 Water Agreement between the two countries was unfair to Malaysia. Singapore pays 3 sen (1 Singapore cent) per 1,000 gallons for its supply of raw water from Johor, and sells treated water back to Johor at 50 sen per 1,000 gallons. It costs Singapore RM2.40 to treat every thousand gallons of water. By selling at 50 sen, Singapore is providing a subsidy of RM1.90 per thousand gallons of water. On the maritime dispute, Dr Mahathir confirmed that "the Menteri Besar went without our permission", adding that "he thought it was Johor waters, that's why he went there". However, Dr Mahathir said Singapore's reaction to the intrusion was quite severe, "as if you are going to war", and described the waters off Tuas as international waters. "It is not Singapore water either, it is international water and the Menteri Besar can go into international water without Singapore sending warships to chase him away," he said. Despite his questions not being fully addressed, Mr Mohan graciously surrendered the microphone to someone else to ask questions, but not before clarifying that the waters were not neutral and were Singapore's according to a 1979 map that Malaysia had tabled. Dr Mahathir was later asked if he believed it was right for Malaysia to expel Singapore in 1965. Singapore merged with the Federation of Malaya, Sarawak and Sabah in 1963 to form the Federation of Malaysia. Singapore left the federation in 1965. "But the fact is that Singapore was a part of Malaysia before. It is our country," he said. "Normally, when a country decides to decolonise, the land goes back to the owner of that land, to the country that owns that land, that happened to Hong Kong and Macau and other places." Dr Mahathir added: "But in our case, we find that people in Singapore are not compatible with the people in Malaysia. They have a different viewpoint, different ideas about how a country should be ruled, so it is for that reason that they were asked to leave Malaysia, and I think it was a wise decision at that time." Dr Mahathir, the first Malaysian and ASEAN leader to be invited to address the Oxford Union, had earlier defended Malaysia's record on democracy and his past leadership in his speech. He spoke about Malaysia's politics and the general election last May which led to a change in government for the first time in its six-decade history. "The election system in Malaysia is proof that we are a democratic country," the Prime Minister said in his address, which was carried live by Astro Awani. "In terms of the people selecting its leaders, Malaysia has proven that it is democratic to that extent," he said, noting that the country has already held 14 general elections. Dr Mahathir, 93, who was viewed as governing with an iron fist during his first tenure as PM, conceded that the country had draconian laws like the now-repealed Internal Security Act (ISA), which allowed for detention without trial and could be abused by the government against its dissenters. "There may be some things that did not conform to the democratic ideals, such as the ISA law," he said, describing it as a statute "inherited... from our colonial masters" that was intended to guard national security. He also noted that he was called a dictator during his leadership. "I just would like to point out that in the history of nations, there has not been a single dictator who stepped down while he was in power and allowed others to take over from him," he said. "Dictators don't usually resign or retire." Mr Darrion Mohan, a Singaporean student at the University of Oxford, finds himself thrust into the limelight after engaging Malaysian Prime Minister Mahathir Mohamad in a debate on Singapore-Malaysia disputes, with some Internet users praising him and others saying he was too confrontational . The 22-year-old pointed out, however, that the Oxford Union - where the forum was held - was "fundamentally a debating society". "When leaders speak at the union, there has always been a strong tradition of them being confronted with tough questions and challenged robustly," he told The Straits Times in an e-mail interview. A video he posted on Facebook of the six-minute robust exchange with Tun Dr Mahathir last Friday at the Oxford Union, Britain's prestigious debating society, has garnered more than 7,500 likes, about 5,700 shares and 1,400 comments. The comments were mostly supportive, although there were some critics. "Superb young man. You have stood up loud and clear for your country," Facebook user Elizabeth Nair said. Another user, Ruth Tay, said: "I do not know you personally but I think you were outstanding! You have expressed the views of the majority of Singaporeans." But user Peter Koh said: "Why you so kaypoh (Hokkien for busybody)? Leave it to the governments to settle lah." Another user, Terence Charles Darby, said: "When a dispute arises between neighbours, often raising voices at each other can only worsen the situation. Very often, a winning argument need not be had through an aggressive attitude." Mr Mohan, a second-year history and politics undergraduate, had referred to the Johor Menteri Besar's recent intrusion into Singapore waters, and said Singapore and Malaysia were "again embroiled in an unnecessary and potentially internecine maritime dispute". During the public forum, Mr Mohan had asked the 93-year-old Malaysian Premier if he agreed that Datuk Osman Sapian's intrusion into the waters off Tuas on Jan 9, which led to the postponement of an annual bilateral meeting, might add to the perception that the Malaysian government is "pugnacious", "acts in bad faith", and "wants to return to the days of confrontational diplomacy and barbed rhetoric". He asked Dr Mahathir, who had earlier addressed the society, if any action would be taken against Mr Osman. He also listed the Singapore-Kuala Lumpur High-Speed Rail project, the airspace dispute over Seletar Airport, the proposed "crooked" bridge between Johor Baru and Singapore, calls to revise water supply prices and the maritime dispute as indicators that Dr Mahathir wanted a return to the "fraught relations with Singapore" seen during his first stint as premier between 1981 and 2003. Mr Mohan said he regularly attends talks by speakers at the Oxford Union and often takes part in the question-and-answer sessions, and had been looking forward to Dr Mahathir's talk. "As the maritime dispute is a current and controversial issue, I thought that it would be interesting to get Dr M's views." Founded in 1823, the Oxford Union is one of Britain's oldest student unions. It is known for its high-profile speaker events, at which members are free to challenge the views of the speakers. It has hosted world leaders from diverse backgrounds, from politicians and musicians to sporting legends and literary greats. Past speakers included former United States presidents Richard Nixon, Jimmy Carter and Ronald Reagan, the late pop star Michael Jackson, and Argentinian football great Diego Maradona. Mr Mohan felt that the most noteworthy point of his exchange was when Dr Mahathir repeatedly referred to the waters off Tuas as "neutral waters" and "international waters", contradicting earlier claims they were Malaysian waters. Dr Mahathir had remarked that Singapore's reaction to Mr Osman's visit was quite severe, "as if you are going to war". He had then added: "It is not Singapore water either, it is international water and the Menteri Besar can go into international water without Singapore sending warships to chase him away." To this, Mr Mohan said: "Dr M's concession that these are, in fact, international waters undermines Malaysia's initial claim and suggests that Malaysia has no basis for extending Johor's port limits." He had hoped that the elder statesman would answer his initial question about the bilateral disputes instead of focusing on the 1962 Water Agreement. "Taking into account his record and positions, Dr M could offer a unique perspective, and I was interested to hear his views," he said. The elder of two brothers, the avid cross-country runner studied at Raffles Institution and enrolled at the University of Oxford in 2017. He declined to give more details about his family. He said he is not receiving a scholarship from the Singapore Government or the private sector, but was "lucky enough" to have been awarded a partial academic scholarship from Oxford after doing well in his first-year examinations. According to his LinkedIn account, he was an intern at Singapore's Ministry of Foreign Affairs between January and March in 2017, and at management consulting firm McKinsey & Company between September and October the same year. He said that he decided not to hog the microphone after seeing a number of raised hands in the audience. He felt that it would not be fair to prevent others from engaging Dr Mahathir. He said: "The norm is to ask a single question, with perhaps one or two follow-up questions. A back-and-forth exchange like the one I had with Dr M is rare."